When you’re eating plant-based, breakfasts with protein can be hard to find. Especially convenient ones, like, say, from Starbucks. Between that plant-based breakfast challenge and the fact that I often find myself trying (unsuccessfully) to dig up a quick breakfast when I’m out and about, I was pretty excited to discover Starbucks’ new menu item, Strawberry & Toasted Almonds Overnight Grains. 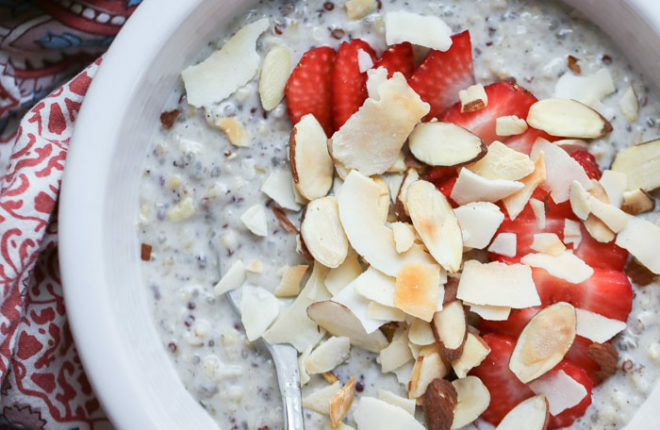 It’s steel cut oats, quinoa, and chia seeds all swimming in creamy coconut milk, then topped with fresh strawberries, toasted sliced almonds, and crunchy shaved coconut chips. It’s delicious and satisfying and plant-based and has a decent amount of protein and, well, you probably know what’s next … I just had to figure out how to make it at home so I could have it whenever I wanted (without spending as much cash). Second, in order to maintain the creaminess, it requires a lot more coconut milk than I originally thought it would! Two cans’ worth. And you need to stir it in after you cook the oats. I tried cooking the oats directly in the milk thinking it would be uber-creamy perfection but after chilling it was just too thick. I didn’t want thick. I wanted creamy. 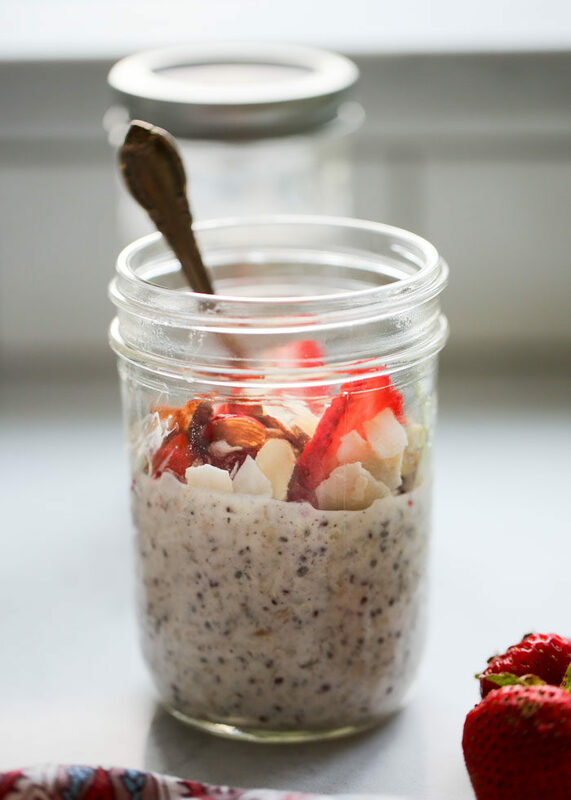 Overnight oats is one of my favorite camping breakfasts, so last time we went out, we took some mason jars of these Strawberry & Toasted Almonds Overnight Grains with us. LOVE! 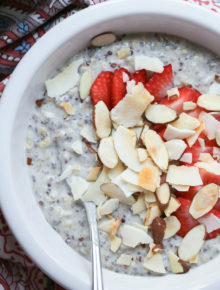 Stow the grains in the RV fridge or ice chest, pop ’em out come breakfast, top with sliced strawberries, coconut chips, and almonds and voila. 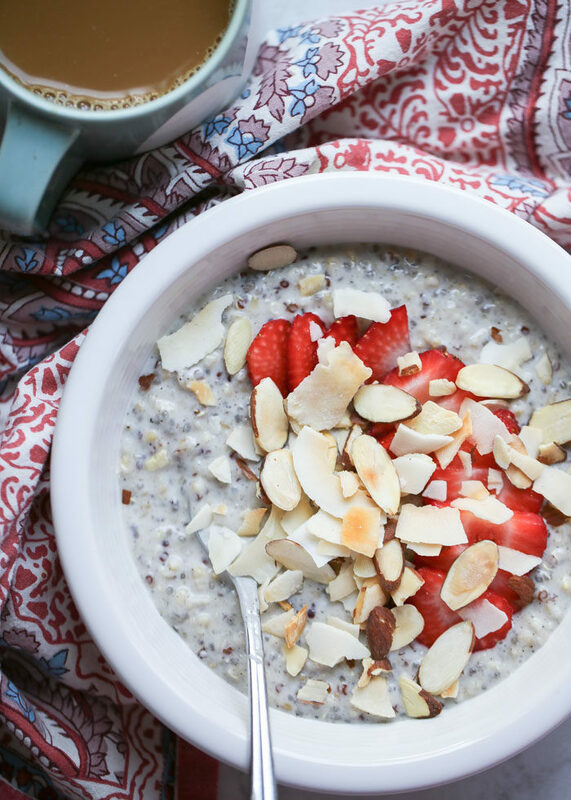 A power-up breakfast that requires zero work (at least, not at breakfast time). Add water to a large saucepan set over medium-low heat. Stir in the oats, quinoa, and salt. Cook on medium-low, uncovered, until the grains are just tender and the water has evaporated, 15-20 minutes. Remove from heat. 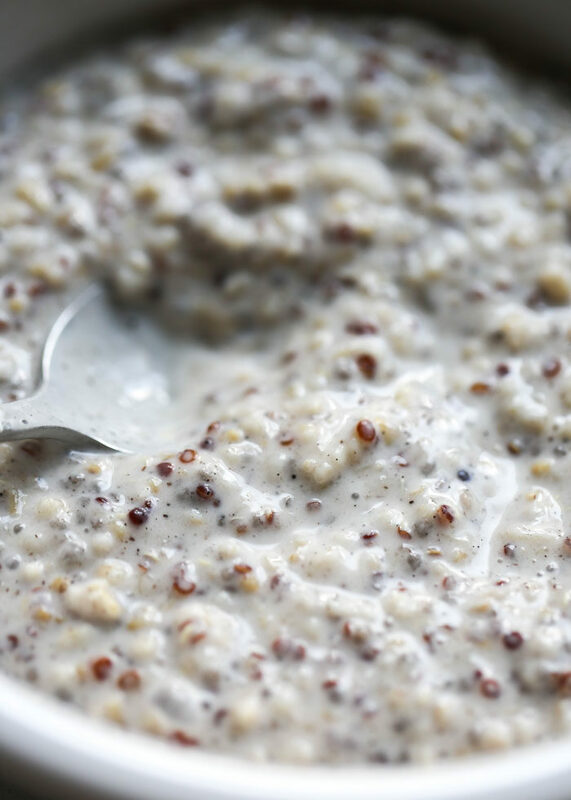 Stir in the coconut milk, chia seeds, honey or maple syrup, and vanilla. Taste and add additional sweetener if desired. Allow to cool, then pour into eight separate containers (about 1 cup per container). I like to use mason jars because they have lids + they’re sturdy and portable. Seal and refrigerate (it should keep for 4-5 days). At the time of serving, top with strawberries, almonds, and coconut chips. 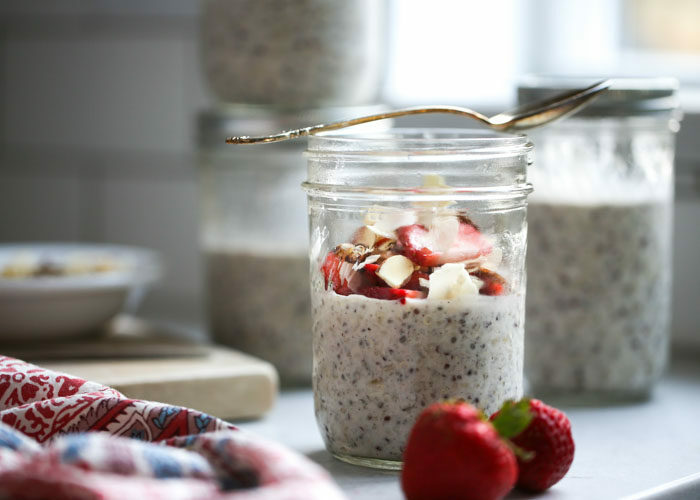 Eat directly out of the jar or pour into a bowl – your preference! * To toast the almonds, heat the oven to 325 degrees Fahrenheit. Spread raw sliced almonds in a thin layer on a rimmed baking sheet. Bake, stirring once or twice, just until some pieces begin to turn lightly golden – about 5-6 minutes. Remove from oven and let cool. Use pure maple syrup instead of honey. Wow, those strawberries really look like they complete the sweetness of this recipe! This copycat recipe is excellent! My family loves it. It tastes almost exactly like the Starbucks grains bowl, but I can add even more fruit! Nice work Kare! Oh yay! I’m so happy to hear that. Thank you for the review! I’m getting excited to start making this again for breakfasts now that the weather is getting warmer again!